Interesting enquiry received from Alan Griffin (UK) researching death in September 1899 in a motor vehicle of Mina McCleod who may be first woman in UK to die in a car. 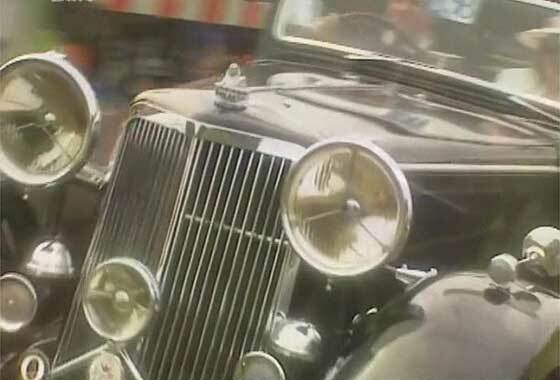 Car was hired from British Motor Coupe Co. What was the car? -- No trace of name in records or internet, but our Ariejan Bos found article in Motor Car Journal of 1899 concerning a Nina McLeod killed in a German cca 1899 Daimler 4HP from British Motor Coupe Co, offshoot of British Motor Company, UK agents for Daimler. Cinema screen grab taken from taken from an British TV Series "Jeremy Clarkson's Motorworld" shown 1995/6 where cars are being investigated by IMCDB. This is from Episode 4 investigating motoring cultures of various countries, this one being Iceland. -- Our Ariejan Bos advises a 1904 Cudell 7.5 Voiturette, licenced from De Dion Bouton and made in Aachen Germany. This one was the very first car in Iceland imported by TA Thomsen via Danish Automobile Factory in Copenhagen. 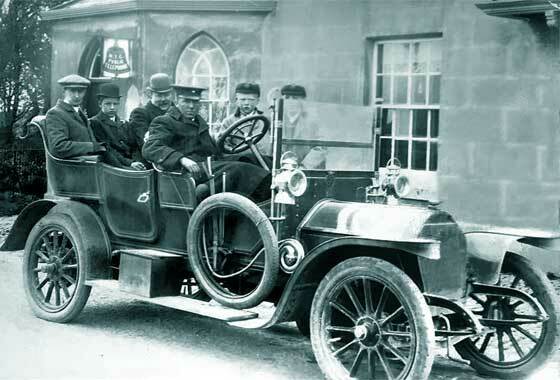 Interesting period photo received from Nick Weir, Huddersfield (UK) of a car belonging to Dr Orr, a medical practitioner of Lindley, seated rear nearside in bowler hat; on the offside is Nick's Grandfather, Alexander Weir. 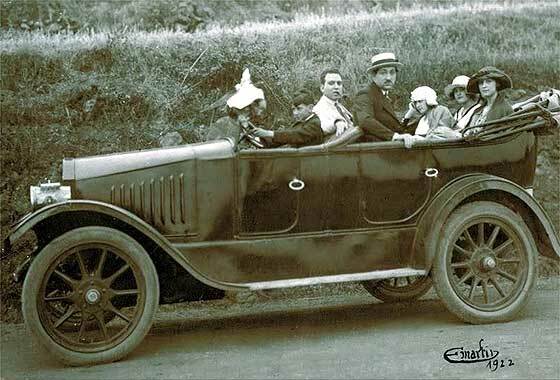 Front are Dr Orr's twin sons, Douglas & David and the driver was called Crawford. -- Unusual one cracked by one of our wises sages as an Italian cca 1907 S.C.A.T. Tourer, 12 or 16HP (Società Ceirano Automobili Torino, 1906-32). Ceirano Brothers largely started Italian car industry. 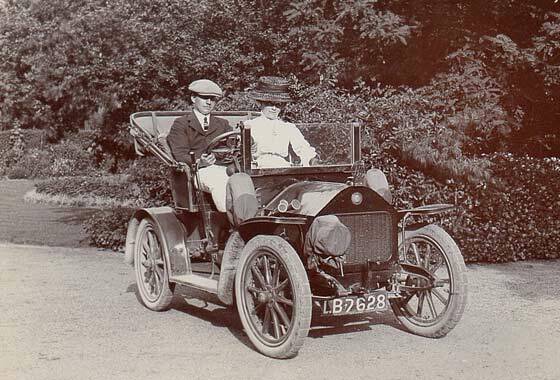 Lovely period photo received from David Osbourne via Andrew Randall (UK) saying "Mystery car that you could forward to an Oracle who might be able to identify! LB was a London reg in use from 1908 - 1909. -- Yes London and at 7628 registered in 1909. The primary identification feature is the radiator with a high forehead and the circular badge with a couple of DDs, second one reversed. This is a cca 1908 Darracq Two-Seater, and short wheelbase favours it being the 8'10HP twin cyl. 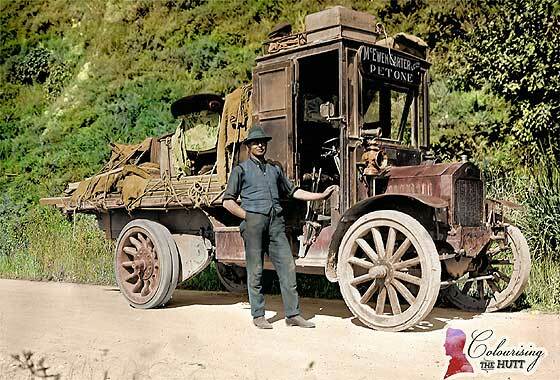 Rather splendid photo received from Mark Dawber (New Zealand) investigating a lorry from a series of pictures in an exhibition called 'Colourising the Hutt' - the Hutt being the outer parts of Wellington, the capital city of NZ. -- Fantastic colourising by Brendan Graham. Love the rust tint to the body. Recognised but could not immediatly identify radiator. Bit of help advised Albion and bit more research advises probably a cca 1911 Albion A3 chassis with the 25cwt payload flatbed. 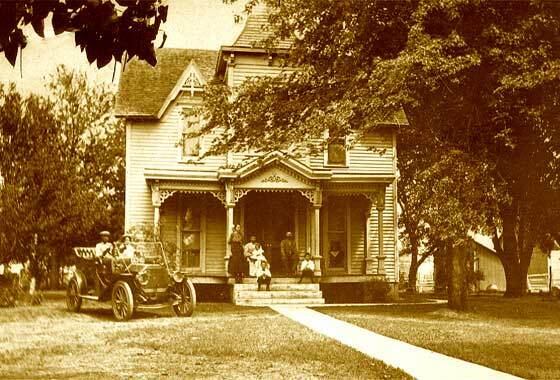 Very puzzling photo sent to us by Roger Denhart from Illinois (USA) of his grandfather Louis Denhart who built this home about 1900. He had the first car in this small farming town in 1912. Was a highly successful farmer, farming over 640 acres in 1912 with 12 hired men and 40 large draft horses. " 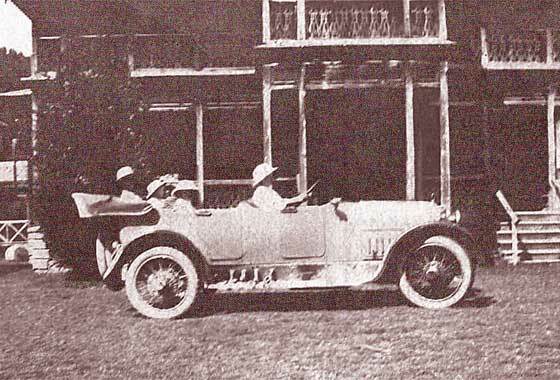 -- Originally unidentified, but Ariejan Bos advised this is cca 1911 International Harvester Tourer. Made high wheelers 1907-11, Model J for only one year, before car division closed, favouring trucks. Cinema screen grab taken from taken from an British TV Series "Jeremy Clarkson's Motorworld" shown 1995/6 where cars are being investigated by IMCDB. This is from Episode Six investigating motoring cultures of various countries, this one being India. 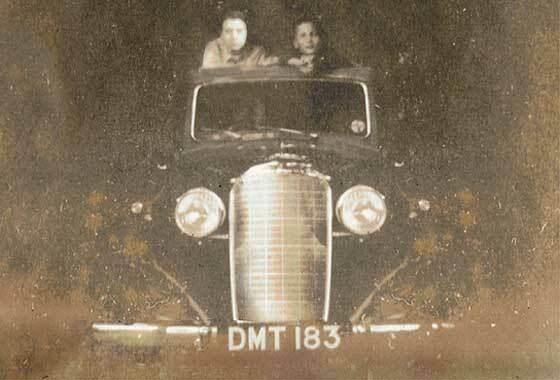 -- Reported locally as being a c1913 Daimler Two Seater & Dickey Tourer with HH Maharajah Rana Ranjit Singh of Barwani. Length of car/bonnet sugests a big car, possibly the 40. Maharajah was militarily active France WW1. One of a number of interesting and puzzling photos sent to us by Mike Mackrill (UK) who has high quality photo website called Nostalgic Picture Library. Can we identify vehicle? 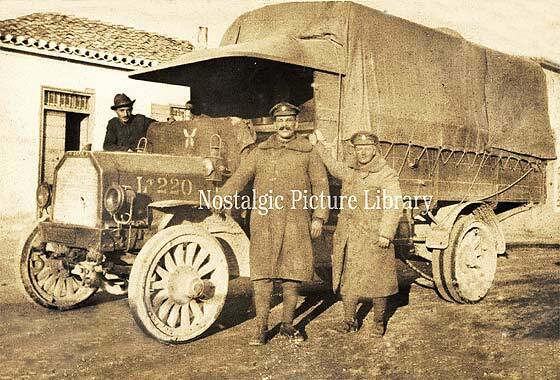 -- As not military experts no idea on uniforms, or where photographed, but we are relatively sure this is a cca 1915 Peerless TC4 Open Back Lorry, one of 12,000 purchased by UK Government during WW1 from Peerless of Cleveland, Ohio, USA, and bodied in the UK. Also supplied Austin who added armored car bodies. Couple of interesting photos sent to us by Mike Statham (UK) requesting identification. Photos were taken somewhere in Kashmir 1919 to 1921. They were in his grandfather's collection from his time in the army in India (parts now Pakistan). -- This photo remained unidentified as too blurry and not really possible to make out any identification features. However we have now been advised by Varun Coutinho that he thinks it is a cca 1917 Willys-Knight Model 888 Touring. One of a number of interesting and puzzling photos sent to us by Mike Mackrill (UK) who has high quality photo website called Nostalgic Picture Library. Can we identify? -- As not military experts no idea on uniforms, where taken, or gun size. But we are relatively sure this is a cca 1918 Peerless 5 ton Gun Carrier. 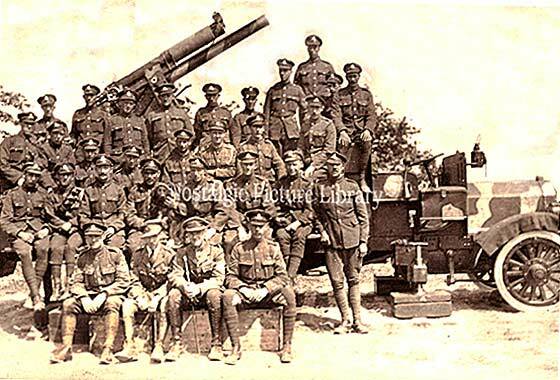 We have a photo of a same type vehicle in France dated 1918 with a similar gun described as a 13 pounder 3 inch mounting? Supplied to UK WD by Peerless, Cleveland, USA, bodied UK. 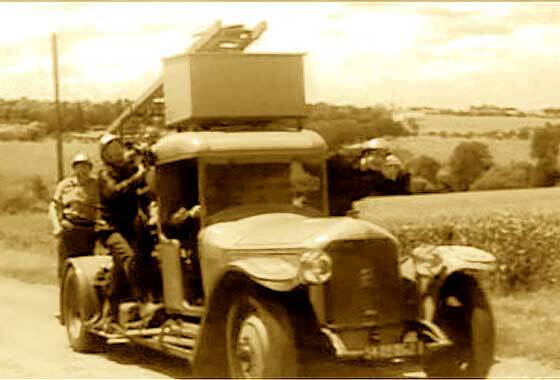 Cinema screen grab taken from taken from a French film "Le Magot de Josefa (Josefa's Loot) made in 1963 where cars are being investigated by IMCDB. Story of a comedy of the complications caused by a young man passing cheques on the strength of his mother, a village grocer, being rich.. -- Interesting vehicle, this being a cca 1921 Rochet Schneider Series 18400 Fire Engine, 6 cylinder motor 6250cc, and with an auxiliary suction fire pump driven by four cylinder Delahaye engine. Interesting period photo received from Hamish Robertson of the Iziko Museum of Cape Town (South Africa) questioning the dating of photo as 1897 and person being John Sprigg, then Prime Minister. 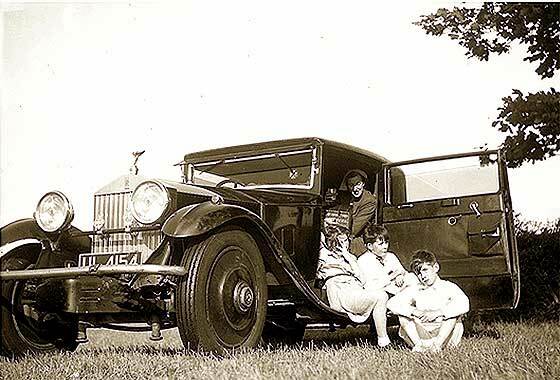 -- Our R-R experts confirm right to question as photo is mid 1930s of c1924 Rolls Royce Silver Ghost 40'50HP Barker "Pullman land/ville", purchased new by P. Donahue, address given as Claridges Hotel, who sold it c1931 to Earl of Clarendon, the British G-G of SA in Cape Town from 1931-1937. Cinema screen grab taken from taken from an British TV Series "Jeremy Clarkson's Motorworld" shown 1995/6 where cars are being investigated by IMCDB. This is from Episode Six investigating motoring cultures of various countries, this one being India. 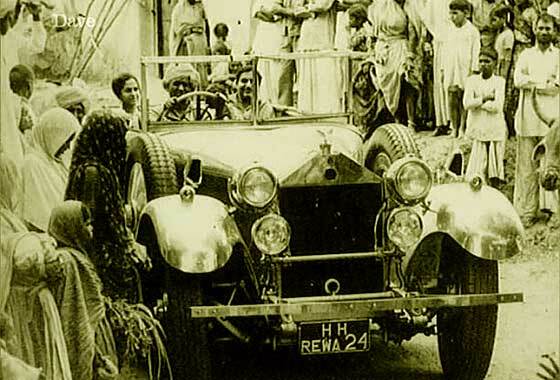 -- This is an interesting car because it is named as a 1926 Daimler 45HP Barker supplied to the Maharajah of Rewa but fitted with Lanchester grille and badges similar to less showy limousines as ordered by the Duke of York. Another photo received from our regular contributor Raoul Rainer from Stuttgart (Germany) from a batch of photos he purchased recently and has on a big website on line. Thinks American car because of its size, the wooden "artillery" wheels, and the drum-shaped headlamps -- This one had proved quite a difficult one but our Mark Dawber has determined that the 12 bolt hubs, drum headlights, cowl lights and the two rivets on the front mudguard, spell out c1926 Hupmobile E2 Brougham or Coach. 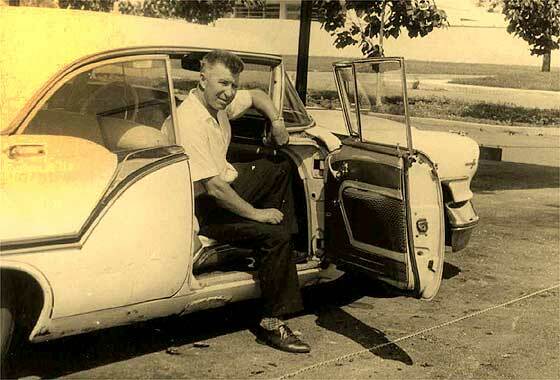 Photo posted on AACA website by Mark (USA) saying his brother has a friend in GB that is looking to identify this car that was his father's.Thanks for any and all help! -- Registration is from UK, released by County Council of Northampton issued late 1929. 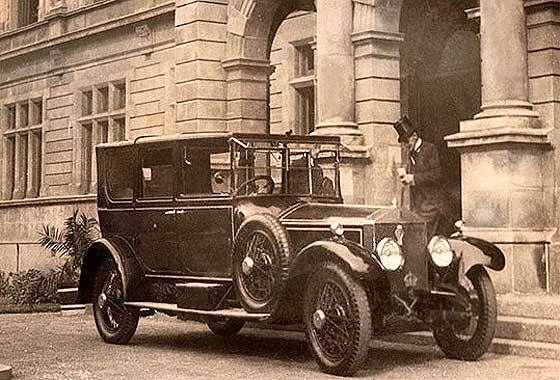 It does indeed seem to be a cca 1929 Hillman 14 Fabric Saloon. 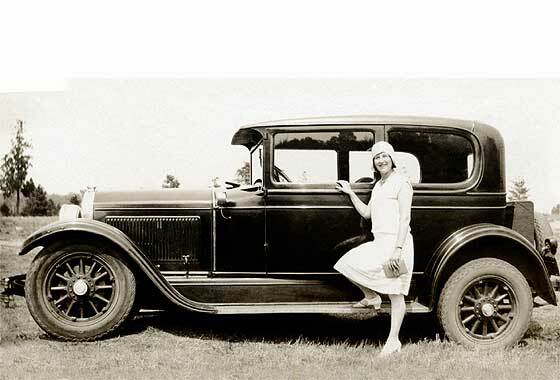 The detail of the cross-bar for the headlights was introduced in late 1928, and lower rad panel and no later bonnet catches and handle confirms the year as 1929. Another photo received from Turtle Bunbury (Eire) who is trying to identify vehicles associated with Lisnavagh House and Gardens in County Carlow, Ireland, and the various family members associated with the house. 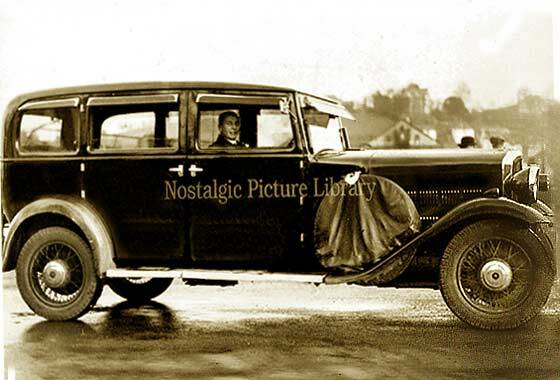 -- Our marque experts identified it as a 1929 Rolls Royce 20 Barker 2 door Fixed Head Coupe originally owned by Ethel Donn of Regent's Park, and after other owners, was taken over from May 1937 by the Hon W. R. McClintock-Bunbury to his death in 1959. One of a number of interesting and puzzling photos sent to us by Mike Mackrill (UK) who has high quality photo website called Nostalgic Picture Library. Can we identifyvehicle ? -- Not as easy as it looks, so the photo has done the rounds of our experts. 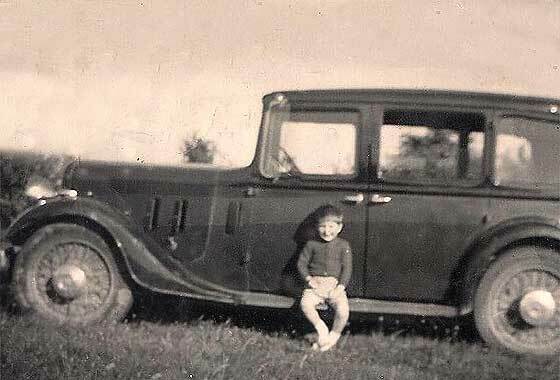 A number of obvious pointers suggests to this being a cca 1932 Rover Meteor but bodywork is non standard. Meteor was short lived '31-34. A 7-seat coachbuilt limousine de luxe was available ! The coachwork may have Gordon-Cunard design? Cinema screen grab taken from taken from an British TV Series "Jeremy Clarkson's Motorworld" shown 1995/6 where cars are being investigated by IMCDB. This is from Episode 7 investigating motoring cultures of various countries. -- Not an Armstrong Siddely but a Siddeley. Armstrong Whitworth introduced the high-performance 1933 Siddeley Special car, the majority of its engine components being of Hiduminium aero engine light alloy. Only 253 costing £920 were made. Rather blurry and damaged photo received from Mike Wakefield (UK) saying "This isn't a great photo, but my dad owned this car in the early 1960's. We called it "The old bus" because it seemed huge. It must of created quite a stir when parked outside our old council house! It had pull-down tables in the back and draw curtains. -- We have slightly repaired and enhanced photo and can advise that from the quaterlight front window, this seems to be a cca 1935 Austin 16'6 or 18 HP Saloon. Small damaged photo in my wife's family albums (UK) believed put together by her late father; a Major in the Western Desert in WW2 and connected with the the clandestine Long Range Desert Group. Lots of tank transporters and Egyptian pyramids, and a postage stamp photo believed of him as young man. -- The registration DMT 183 is Middlesex County Council issue. 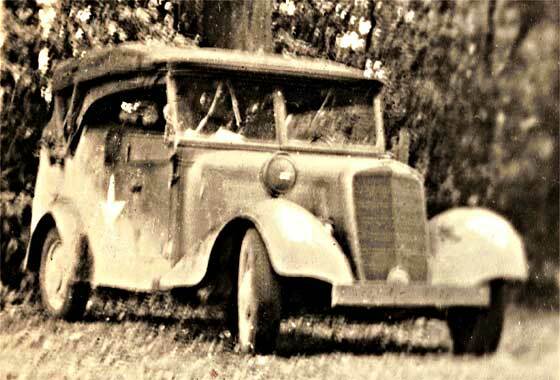 Car is a little difficult to make out but has flutes on the bonnet and lights on bar which suggest cca 1936 Vauxhall Light Six. A rather damaged family photo found in my wife's family albums (UK) believed taken by her late father during WW2 when he was a Major in the Western Desert and connected with the the clandestine Long Range Desert Group. Photos of Egyptian pyramids, and tiny photos of staff car with Allied star on the side. -- The Star is confusing because after much investigation the vehicle is German and is a cca 1941 Mercedes Benz 170VK Staff Car. Seems used by father-in-law on 'Allied' business! 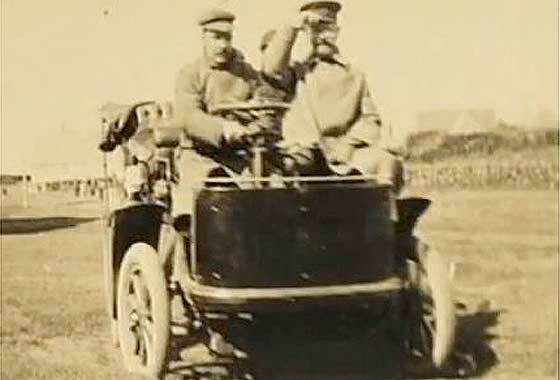 A very small grainy photo being investigated by George Layton (Thailand), asking if it is an Italian car ? -- At first glance looks very Italian and looks bit like a 1960s Alfa Romeo Giulietta Sprint. The overall impression was of a Zagato bodied Giulietta, but bigger and more exotic; a Gran Turismo. Bit of digging confirmed Italian, made in Modena. 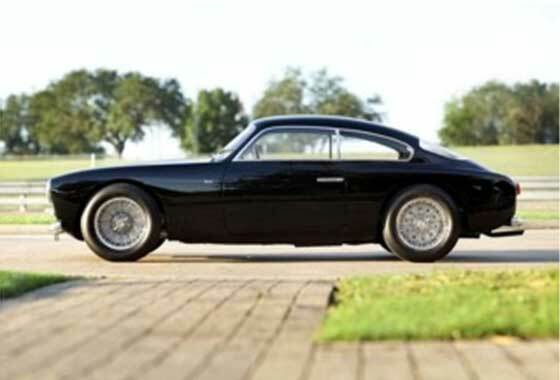 This is a cca 1955 Maserati A6G/54 2000 Zagato Berlinetta, a competition-oriented fastback by Zagato of which only 20 were made. Another very interesting photograph sent to us by Andrew Kostin from Moscow (Russia) who is a collector of old photos. This is a photo of the Soviet military advisor in Cuba, 1960s. Any chances to ID his vehicle? -- A bit modern for us so contacted our Mark Dawber who advises it is a 1957 Oldsmobile Super 88 Holiday Coupe. Obviously been in Cuba for a few years from the rust on the sills. Two sizes of car that year, 88 and the 98. Badge just visible on the front wing fairly surely says Super 88. Another very interesting photograph sent to us by Andrew Kostin from Moscow (Russia) who is a collector of old photos. 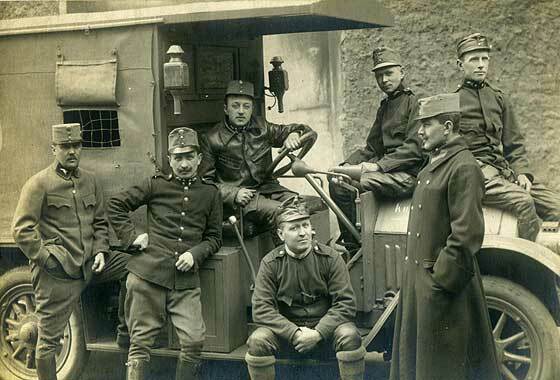 This photo taken somewhere in Austro-Hungary and is showing military ambulance vehicle with soldiers. Is it possible to identify the vehicle? -- Another photo that has eluded identification by our experts. Main reason is that most of the identification features of the car are hidden by the soldiers and those that are visible do not fit the vehicles this was likely to be. 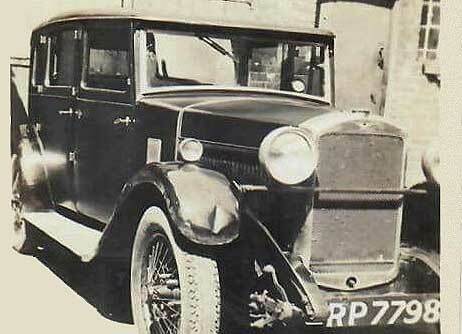 Very puzzling photo sent to us by Rafael Diaz Naval (Spain) headed "Antique car from Tenerife, Canary Islands, and states "The photo is 1922... (door crank I see similar on 1916 Singer car)" . -- Not a Singer and has puzzled all our experts. Probably not American as does not seem to have external contracting rear brake. Suggestions it may be a well home-constructed car. Possibly a European chassis with American body cca 1922. Unusual slope to the bonnet, reminiscent of Hupmobile.